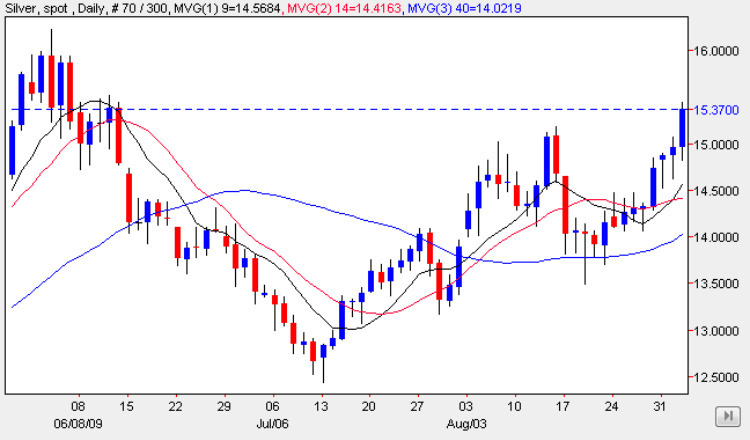 Not quite dramatic as the breakout in the gold chart, but nervertheless very welcome, as silver prices picked up on the bullish sentiment in the metals market, closing the day with a wide spread up bar, which finished well above the $15 per ounce price level outlined in yesterday’s silver market analysis. and closing just below the next level of resistance that must now be breached in the $15.50 to $16.00 price range. With all three moving averages pointing higher and with very little ahead to slow progress, and given the breakout in gold prices which has established a new and upwards trend, then we should see a similiar pattern emerge in the silver market as silver prices move higher in a sustained manner in the next few weeks.